If you are a business who hasn’t quite broken into the online world then you are at the right place. Here are 6 reasons that will leave you wondering why you hadn’t done it sooner! You can create the web that evolves with you to handle the lifetime of data. So, it’s basically a one-time investment. It’s gonna be convenient for your customers to find out who you are & what you offer online. As a result, you can worry less about making your business popular. You can save cost on various traditional advertising which serves no use in this digital world. Instead, you can advertise on your own website with pride and authenticity. You get an instant message through SMS/ Email whenever a visitor is looking forward to contacting you. Your business is showcased to the entire world because the internet offers a global community. As a result, you get more visitors and more visitors which leads to more potential sales. 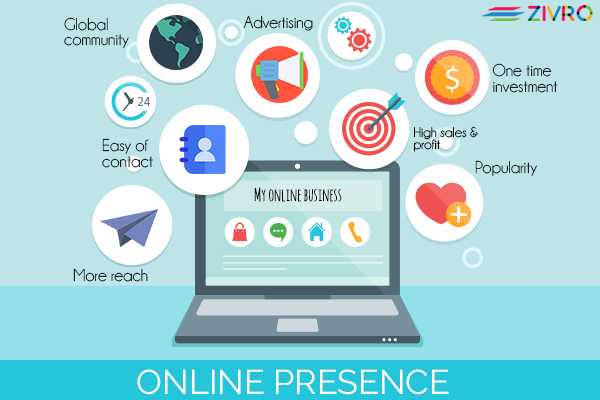 That’s how your online presence will help you. So Create a Website right now with Zivro & boost your Online presence!